Reviews: PMC Result6 (Cover), Rupert Neve Designs 500-series, Universal Audio Arrow, Dangerous Music Convert-8, Arturia Clavinet V, Roland SH-01A, Neumann KH80 DSP, Subpac M2X, Intellijel Plonk Eurorack module, PreSonus StudioLive 24 Series III. 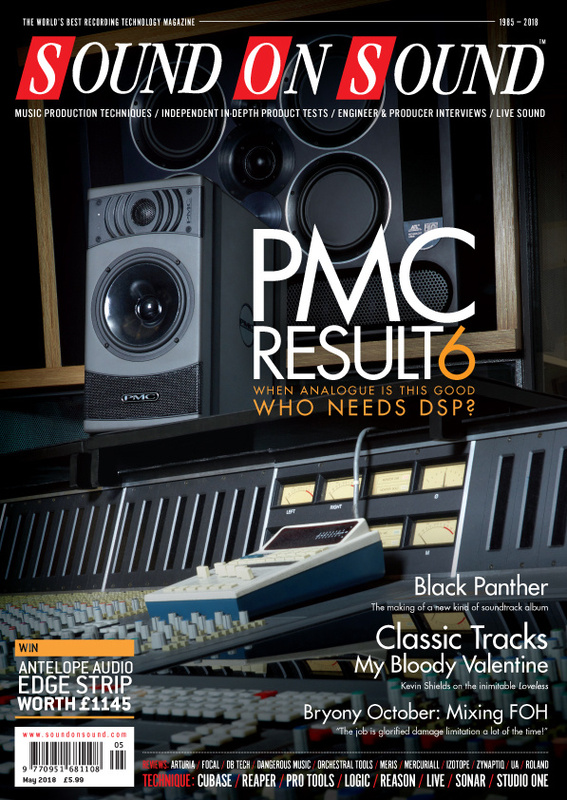 Technique: Inside Track: Black Panther: The Album, Bryony October, Classic Tracks: My Bloody Valentine, Session Notes: An Album In Five Days, Power Amps For Passive Monitors. Developed in conjunction with Matthias Puech, the 4MS Tapographic Delay is a hands-on 32-tap delay with a maximum delay time close to three minutes. Arturia’s new V Collection includes a digital tribute to possibly the funkiest of all keyboards — the Clavinet. The JB-2 Overdrive is the first example of Boss collaborating with a boutique pedal builder — US company JHS Pedals. With its twin 12-inch woofers, this compact column system packs rather more punch than your average mini line‑array. Partnering again with veteran iOS music-makers Blue Mangoo, Embertone's Jubal Flute is the second of their Kontakt instruments to be released in iOS guise. Epic Risers and Epic Drops are designed for the full version of Kontakt (v.5.6 or later) and provide the sorts of ‘riser’ and ‘drop’ sounds that have become firm ear-candy favourites for cinematic composers, game sound designers, and music producers in various contemporary genres (EDM and hip hop). The latest versions of iZotope’s Ozone and Neutron are not only more intelligent than their predecessors, they can also communicate with one another. Mercuriall’s painstaking recreation of a classic Mesa guitar preamp offers more than just rock nostalgia. Fritz Lang’s Metropolis inspires a third epic sample collection, while Berlin Orchestra Inspire provides a full symphony orchestra in a single package. This major update to PreSonus’ popular multi-purpose mixers endows them with a host of new features — including, for the first time, motorised faders! Classic low-pass gates are probably best associated with the Buchla modulars. However, Rabid Elephant decided against the vactrols, aiming to produce something faster, more accurate, durable and natural-sounding. Roland continue to mine their considerable legacy with another Boutique module, this time based on the simple but much-loved SH-101. We cast our eyes and ears over Mr Neve’s elegant contributions to the 500-series format. Low frequencies are the weak point of nearly every home and project studio — could this unique tactile subwoofer give you the edge? The Arrow offers two-channel recording and Universal Audio’s celebrated plug-ins, all at the end of a Thunderbolt 3 connector. Zynaptiq’s unique blend of pitch-shift, delay, reverb and other effects will take you into parallel musical universes! It may be famous for its difficult birth, but Loveless was a technical triumph. My Bloody Valentine’s Kevin Shields tells us the story behind their breathtakingly original album. In the hands of Kendrick Lamar, blockbuster movie Black Panther spawned a new type of ‘soundtrack’ album. Engineer Matt Schaeffer was at the controls. With Smart Tempo in Logic Pro 10.4, you need no longer record to a click. The need to substitute one clip for another arises frequently, and Pro Tools is ready to help out. We get to grips with Reason’s aptly named Radical Piano. Working with a producer and an ambitious timescale, our engineer planned ahead for the best chances of a good result. Add a human element to your drum parts with Sonar’s various quantising options. Learning how to use Studio One’s templates can make a massive difference to your efficiency. Take our crash course on Live 10’s new Wavetable synth. Recording a library of acoustic guitar samples highlighted the importance of repeatability, blind testing, small lasers and double‑sided sticky tape. There are many jobs involved in large-scale touring — and established front-of-house mixer Bryony October has pretty much done them all. Sounding Off: Losing Our 'Human' Sound? Are we losing touch with what ‘human’ sounds like? Read more about Sounding Off: Losing Our 'Human' Sound? Brush up on your listening skills, as we dissect some hits from a recording and production perspective. This month: The Infamous Stringbusters, Logic, Chris Stapleton, NF, and Whitney Houston. Whether it’s classic NS-10s, battered old Auratones or something more esoteric, passive speakers require a power amp — here’s how to choose the right one. Although it only opened for business in 2017, Daft Studios did not appear out of the blue. It is, in fact, the rightful heir to and successor of another legendary large studio, La Chapelle. Off The Record: Where can I go? For growth in the music production sector, look beyond your doorstep. Read more about Off The Record: Where can I go? Media content for the May 2018 issue.